Last night I was smacked on the head with some sort of mystery malady. I picked up the babies from day care and new that I needed only to make it one hour until Jen was home so that I could just go immediately to sleep. I fed them and got them in their pajamas and prayed for her prompt return. While I waited Elliott started crying and I could barely move to comfort him. Luckily Martin saw this and took it upon himself to attempt to comfort him by patting his arm. It was a touching moment. Me, being the great father I am, sat back and recorded this incident. This was mostly because I lacked the energy to sit up immediately. Note: I did pick him up after a minute to comfort him. I'm not a complete monster. After Jen got home I helped her get them ready to bed, ate two pieces of toast, then went to bed at 8:00 PM and slept for eleven hours. Today I was till pretty tired but didn't feel completely exhausted. When I got home I set the babies up to play in the kitchen in their walkers while I made dinner. Tonight, in honor of Shrove Tuesday, I made breakfast for dinner. This is something that drive Jen crazy every year because she claims I am bastardizing the holiday by removing the focus from the traditional pancakes. 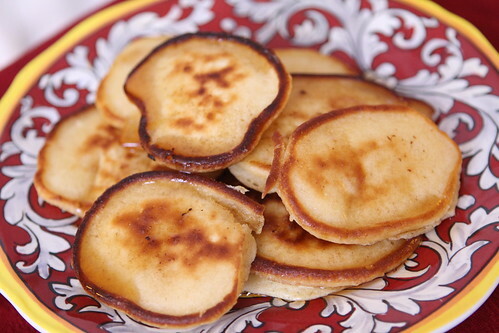 It's interesting because I never used to do anything for Shrove Tuesday until I met her and she showed me to make pancakes and made a side of scrambled eggs. I'm just riffing now. She hates my riffing much the same way she hates jazz. 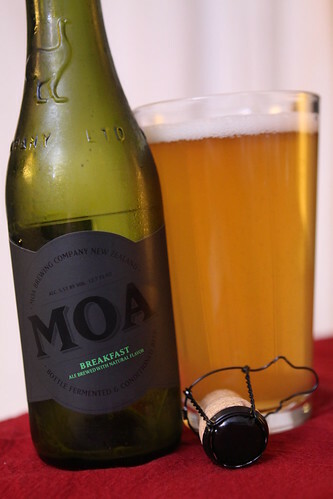 This year to keep with the theme I cracked open a Breakfast beer from MOA Brewing Co. in New Zealand. This beer was a lot fruitier than I thought it would be. Apparently it's brewed with cherries but I tasted more banana than anything. Overall it wasn't what I expected but that's mostly because I'm dumb and didn't read the label. 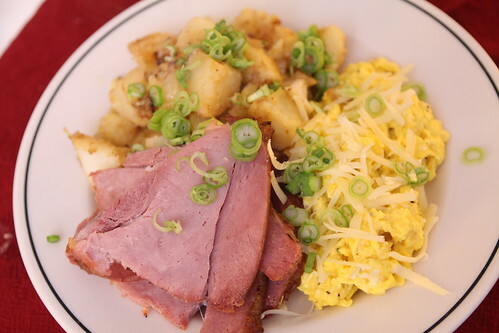 While Elliott dutifully in his crib like a good little boy Martin zipped around the kitchen in his walker while I prepared the first course of our dinner: sliced ham, scrambled eggs with Gruyere cheese, and home fries with crispy onions. Of course I served a plate of steaming hot pancakes to accompany this dinner. Jen made up for her earlier complaining about me bastardizing the holiday by telling me that I make the best pancakes. Flattery will get her everywhere! In the midst of all this eating and cooking Martin has discovered that he can also eat something . . . his toes! Unfortunately he darts around like a minnow and I couldn't get a really great picture of him performing this new task. He seems quite excited about this turn of events as, I'm sure, his Auntie Lauren will also be. After dinner I poured another breakfast-themed beer that I've really been looking forward to trying, this Voodoo Doughnut Maple Bacon Ale from Rogue. I am a big fan of Rogue but I am sad to report that this beer was just awful. I knew what I was getting into. I was fully prepared to taste a strange beer given the name and the ingredients. I was not expecting anything other than a very bizarre beverage. Unfortunately what I got was something that was undrinkable. This is one of only two or three beers in my life that I could not drink. Sadly I ended up pouring it down the drain. I had about 1/4 of a glass but that was all I could deal with. Every aspect of it was unpleasant. It had a harsh and confusing smoked flavor. I've had smoked beers before but this was just awful. I couldn't really pick up on the bacon flavor at all, just the taste of burnt something-or-other. The maple flavor was there but in a very off-putting sweet manner. I can't help but think there's a possibility of making a drinkable beer using this concept. Of course it will be weird but weird is fine. This beer didn't taste weird it just tasted bad. It was so bad it makes me wonder if I was doing something wrong. I mean, all I did was chill it, pour it, and drink it. But surely it couldn't taste like this on purpose. Maybe there was some sort of instruction on the bottle that I missed. It made me question everything. Needless to say I won't be rushing out to try their newest collaboration with Voodoo Doughnut. 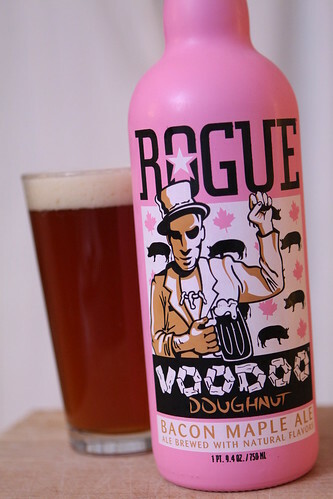 I think it would best if Voodoo Doughnut stuck to doughnuts, Rogue stuck to beers and they never spoke of this again. At least that's what I'm going to do.